September 10 marked the 10th anniversary of when the Large Hadron Collider first powered on. Since it’s already achieved its most well-known goal — to discover the Higgs boson — you might wonder what else is happening at the famous collider. 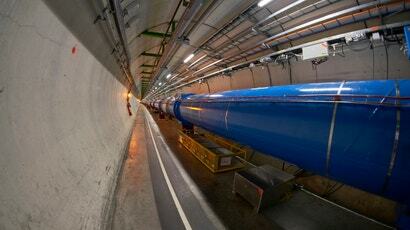 The Large Hadron Collider, located in Geneva, Switzerland, is the world’s largest scientific apparatus. It’s a pair of intersecting 26km-round rings of superconducting magnets that accelerate bunches of particles (usually protons, sometimes entire atomic nuclei) at high energies and collide them inside of building-sized detectors. The LHC’s most notable achievement was discovering the Higgs boson, the last particle predicted by the Standard Model, the blueprint of particle physics. Scientists have since been working on what comes next. It’s true that researchers haven’t discovered a new fundamental particle since the Higgs boson. In fact, what they’ve mostly done is ruled out possibilities for new particles. This is what much of particle physics consists of these days — understanding all of the kinds of particles that don’t exist in hopes of finding something new, like tossing out all of the cereal in a box hoping to find a prize inside. Some of the most likely contenders for new particles have been ruled out; supersymmetry, the idea that every particle has an undiscovered partner, continues to go undiscovered. More on that here and here. Some view the present state of particle physics with a rather bleak outlook, but that isn’t how the younger physicists I speak with generally feel. There are a host of important physics mysteries that remain unsolved, after all. Gravity doesn’t play nicely, mathematically, with the behaviour of the smallest particles. The Higgs’ mass produced as many questions as answers regarding how the universe works, and scientists continue to learn new things about the particle. And many physicists think that most of the universe’s mass exists as a strange, yet-to-be-discovered particle called dark matter — though others don’t. Maybe the LHC could prove, or disprove, the existence of a dark matter particle. Physicists such as Beacham think that, since the LHC was built with the Higgs boson in mind, it’s time to expand our thinking now that it’s been discovered. There are ideas to place detectors tens of meters from the LHC’s collision points to potentially capture particles that travel a long distance before becoming observable. Physicists are also looking at usually ignored data with fresh eyes. There are several ongoing efforts to position the LHC to best hunt for these new ideas. The LHC is about to receive an upgrade that will allow it to see five to seven times more collisions per second. Observing more collisions means gathering more data faster, and gives physicists a better shot at seeing things that may occur incredibly infrequently. Physicists at the accelerator are experimenting with innovations even further down the line. Recently, scientists put atoms containing electrons into the machine for the first time. That experiment was actually a proof-of-concept for some future device that would make the highest-powered gamma rays for use in fundamental physics research. Another team at CERN recently created an electron accelerator a fraction of the size of other electron accelerators. There are some tantalising leads, too. One of the detectors on the LHC ring, called LHCb, observed anomalies in the rate that a particle called the B0 decayed — implying the existence of undiscovered particles — though follow-up research is still in the works. CERN hosts a slew of other experiments designed to illuminate the various attributes of matter, ones that use accelerated particles to study atomic nuclei, antimatter and even the environment. The LHC has an entire program devoted to colliding entire atomic nuclei in order to understand the nature of quarks — the particles that make up protons and neutrons — and the way they interact with one another. In other words, you might hear a narrative that not much has gone on at the Large Hadron Collider since the Higgs boson discovery in 2012. That’s far from the case, but figuring out what to do next in the face of a whole universe of mysteries is stressful and time-consuming.